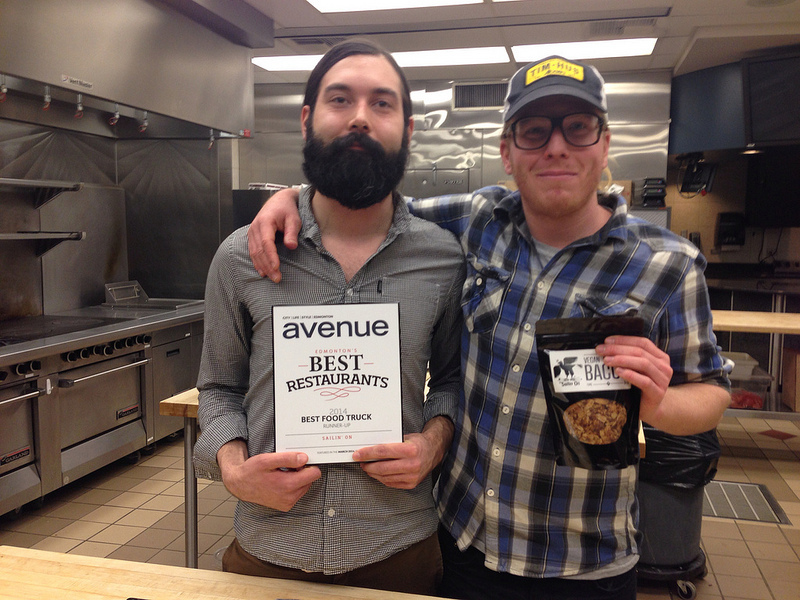 Avenue celebrated the release of their annual Best Restaurants list with a party at Ernest’s Restaurant at NAIT. It was a night of great company, and even better food. Avenue feted its annual Best Restaurants list with a celebration at Ernest’s Restaurant at NAIT on Monday, March 3, 2014. Approximately 300 guests sampled delicious hors d’ouevres from a diverse group of restaurants, including RGE RD, Cibo Bistro, Tres Carnales, Culina Muttart, Bon Ton Bakery, Sailin’ On Food Truck and The Burg. The chefs at Ernest’s Restaurant and the staff at NAIT were the most gracious of hosts, giving tours around their kitchen and providing made in-house bread, cheese, meat and lentils cooked sous vide. Guests were able to pick up samples from the various restaurants as they toured the kitchen space. Chefs were on hand to answer questions about the items they prepared especially for the event. This year’s Best Restaurants list included 21 categories, including Best Overall and Best New. Five restaurants were chosen for the Best Overall category, and the other 20 categories featured three restaurants each. Thanks to everyone who made the evening such a success, especially the team at NAIT and Ernest’s, and, of course, all of the fine local restaurants in Edmonton that make this list possible. Thanks for spoiling Edmontonians year-round. And a special round of applause to our judging panel: Tina Faiz, Omar Mouallem, Gail Hall and Mike Maione of NAIT, plus the Avenue editorial team. Your gluttony makes this list possible. Merci beaucoup!